Gail, it's gone now from BBC iPlayer but it is on YouTube. Search for 'Marilyn Monroe church' or 'Eyesight to the Blind'. Hi Susan what chanel was Tommy on please. I'm just watching the rock opera "Tommy". I'm pretty sure the plastic mac worn by Ann Margret, about 26 minutes into the film, is a genuine Pakamac. I have had a number of the exact same style, they were especially precious to me. Ann Margret's is pristine. I recently watched a TV programme about the 'Cold War' period in Europe during the 60s. What a wonderful sight it was with so many guys in both plastic macs and nylon macs plus loads and loads of ladies wearing nylon macs in a delightful array of colours. It just confirmed to me just how real my memories are of those days. Hi I have a angel sheer by French Connection mac it turns heads when I go out in it hubby is not keen but I love it. Hi Janice Jane is on holiday she will leave a old number for you when she gets back . Hello Janice yes could have been why did you not say hello we would have been pleased to see you why not join us . Hi Agnes I think we saw you in MS three of you looked good. Hi Frank there are plenty of women wearing macs of all kinds I think its time for you to go to spec savers. Agnes, a simple search for 'plastic mac' on eBay brings up lots of the styles of jackets I now see frequently. I would never class a jacket as a mac but maybe it's a generation thing. Ken quite right people should keep it clean and no bullies this a pac a mac site. My observations on plastic jackets are purely my hope that they are an indication that Pakamac styles of mac could make a return. 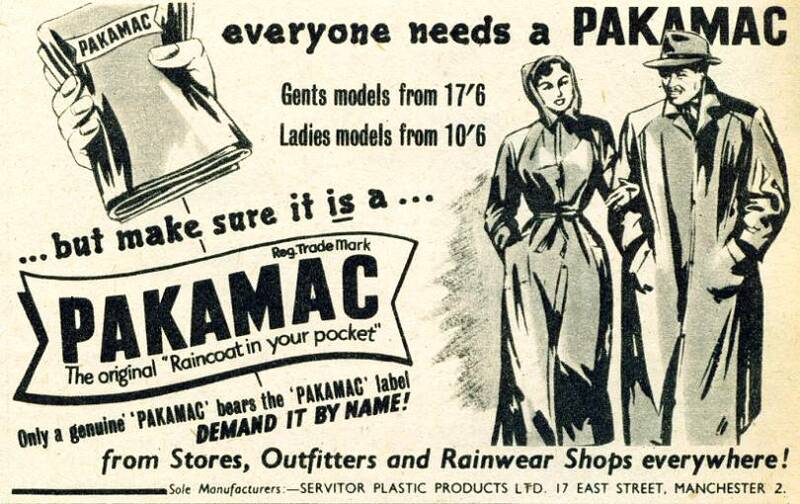 Actually, Pakamac did produce rain jackets. Hi I am on Franks side Brian was getting a bit lurid and Colin have you got a woman or is it just cartoons for you. Frank is the antithesis of 'Think positive' and to stop pitying his hard luck because he can't find a woman who'll do what he wants. BJ you have the wrong Brian its a pac a mac site the clue is in the name and its not a playground pick a fight site . Frank it's Brian's site so he even more than anyone can talk about the price of sardines on here if he so chooses....it's not as though you have ever done much for the site besides whinge whenever anybody else makes a contribution. Hi Brian this a plastic mac and nylon site not rubber macs or Jackets and your flirting with Susan is going to frighten the horses. Sue, it WILL happen. You WILL get one of these plastic jackets, possibly more, and model them SUPERBLY. I may get one, or more, for my own wardrobes. And let's hope the SBR dream comes true too. Always good to hear from you. Over the last two days Brian, I have seen two different plastic jackets on separate women. Definitely a fashion statement. As regards buying an SBR rubber mac for Susan, the thought is always there, but the logistics are not, as Susan knows. However, I hope the barriers can be eventually dropped. Incidentally, Sue, I saw another of those plastic jackets this afternoon, and I thought of you immediately. I hope we discover who retails them. There are similar jackets advertised on e-bay-could these be the ones? hi maybe we should say if you want a six pack wear a mac or do not put yourself on the rack wear a mac. Hi if all the women in the UK read Jane comments about using up calories when walking in a plastic mac may be many more would wear them. Do you know, Brian, I have always wanted an SBR mackintosh, but never had one. However if the choice was between a plastic Pakamac or SBR, the Pakamac would win every time. When PVC macs were easily found, I was in the checkout queue with a plastic mac in it's distinctive Pakamac logo bag. Nice compliment, Frank, thanks very much!! I will try and post more.